I’ve done it again! Bagged myself a bank of three seats, all to myself, on an otherwise full flight. This also happened recently when I took a Ryanair flight from Santiago de Compostela to Málaga after my camino, having booked my flight and checked in only two days before the flight. I have always been a proponent of Ryanair – because their low cost flights allow me to visit my family regularly throughout the year. So long as you play by their rules the flights are hassle-free and almost always on time (largely due to the fact that they seem to add an extra 30 minutes to the actual flight times). Even when they didn’t allow any hand baggage in addition to the cabin bag, and seemed hell bent on catching people out with extra charges, they were consistently incredible value for money. They have recently allowed one extra handbag of limited size (but don’t seem to be worrying too much about the actual size of this bag), and they have very sensibly instigated a rule allowing only a certain number of cabin bags onboard (90) and the rest are put into the hold free of charge. I am perfectly happy to have my case taken in this way, the luggage handling is so quick and efficient these days that my case is often meandering around the carousel before I even get there. And now, to add to all this efficiency, they have started to allocate seats, or you can pay to choose from those available. This new system means that there is no longer a scramble at the gate and on boarding and the whole procedure is so much more civilised and relaxed. I have just been detained in the UK for three days longer than planned, due to the French air traffic control strike on 25 and 26 June. This was no great hardship as it meant that I had time to meet my brother for a leisurely pub lunch and I got to spend extra time with my daughter and grandson. The rebooking of my flight was reasonably pain-free and a phone call on their special (non-premium rate) cancellation phone line put my mind at rest that the additional sum I’d had to pay to secure my new flight would be repaid within 7-10 days. I didn’t check-in until the morning of my flight and lo and behold, I have once again been blessed with a bank of three seats to myself in the second row. The flight took off from Bristol airport just after 6pm in bright sunlight and lots of white fluffy cloud. 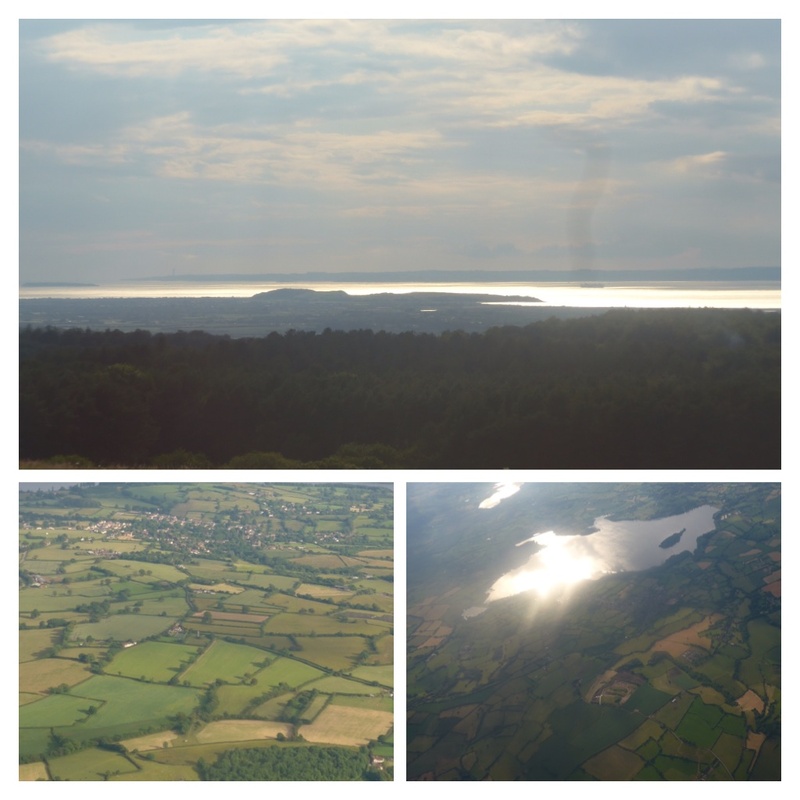 The scene from my window seat on take-off and banking was stunning, firstly with a view of the Weston super Mare area coastline and then over the beautiful mosaic of the Somerset countryside. 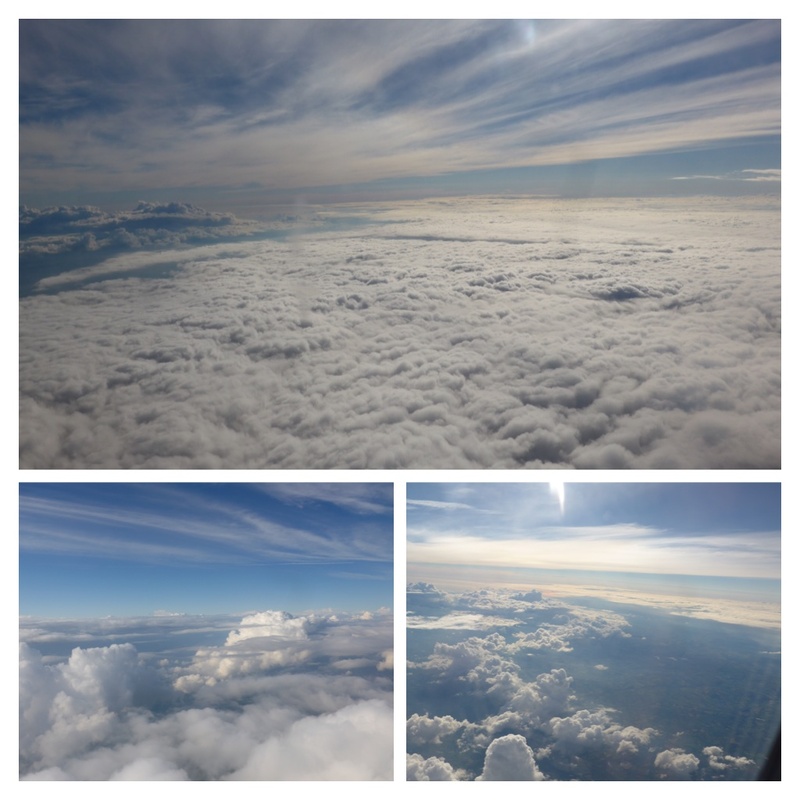 And as we rose above the cloud line I was treated to a fairy tale view of white fluffy cotton wool clouds with the sun bouncing off them, giving the impression of an arctic snowscape. I fly this route very regularly between my home in Spain and my family in Bristol, but most often under the cover of dark night skies where the only view is the occasional twinkling of street lights far below. Today was a real treat. In fact the whole stay has been an absolute treat. My bedroom at my daughter’s house faces east and the sun rises bright and early and pours wonderful daylight through the window. In Spain our house is on the western side of a mountain and the sun doesn’t rise above the peak until much later in the morning and doesn’t hit our house until around 10:30am (but we do see the most stunning sunsets). Soon after the sun wakes me, my grandson comes to join me in bed for an hour or so until it is time to get up and get on with the day. Mikey is growing from a beautiful baby into a charming child, now three and a half and full of chatter. I can’t think of a better way to start the day. 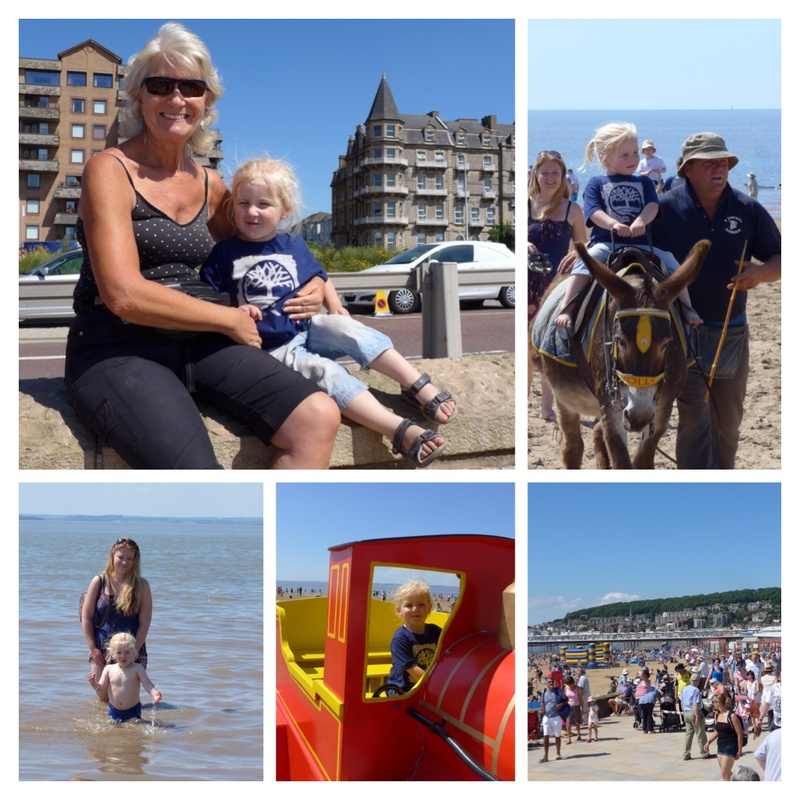 The day after my arrival for this visit my daughter, Mikey and I set off for the beach at Weston super Mare to see an air display, part of armed forces day. But the traffic was very congested so Rosie had the brilliant idea of parking up at the station and taking the train from nearby Worle. I love trains, so it was a another treat for Mikey and me, although not so much for Rosie as she catches the train to work. 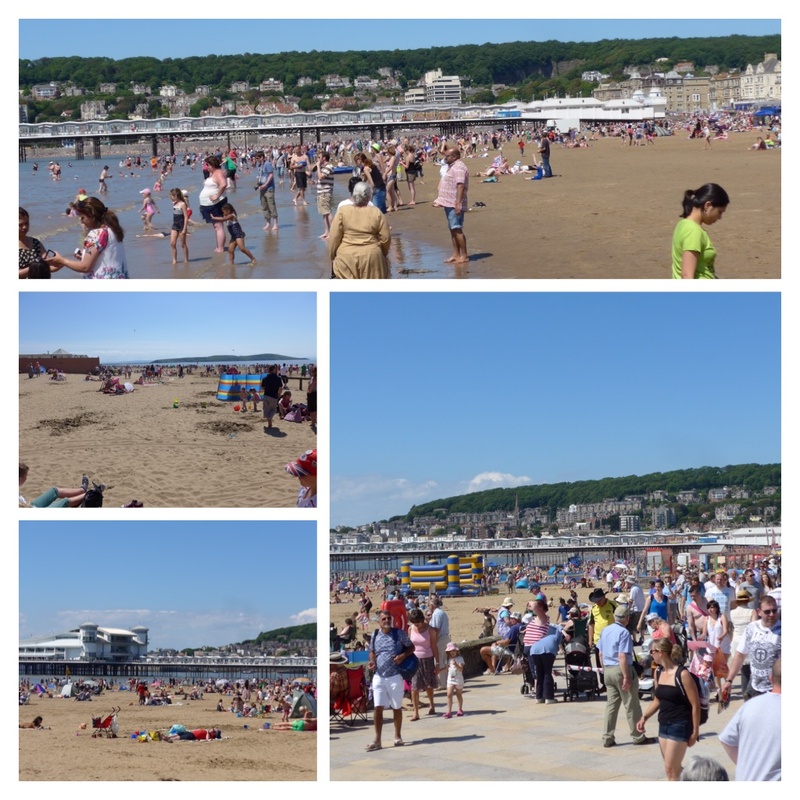 Weston was absolutely buzzing, the promenade and the deep sandy beach were teeming with day trippers and holiday makers, all with smiles on their faces in the fabulous sunshine. I used to bring Rosie and her sister Ella to this beach and it brought back very fond memories. I bought myself a Cornish pasty for lunch (a must-have treat on a visit to the West Country) and then we went for a paddle in the sea, followed by the inevitable donkey ride and horse and carriage ride (Thomas the tank engine carriage! ), all to the accompaniment of various aircraft displaying their agility skills above us and even a performance from the Red Arrows. 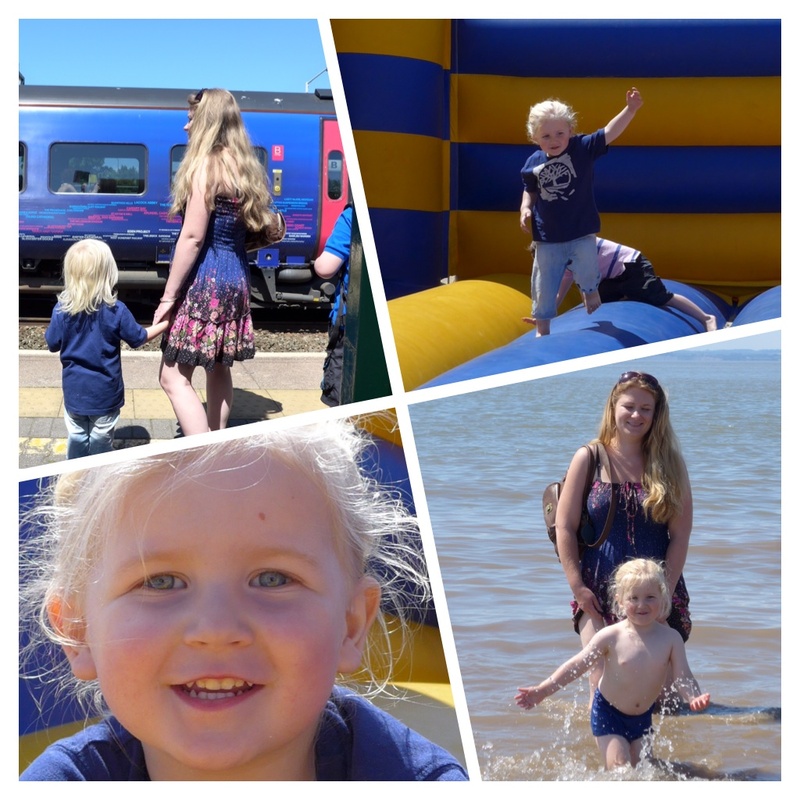 I love to see public spaces being enjoyed by the public, and there was a lot of enjoyment being had this day! I had a quick shower to wash the sand from my feet before setting off to meet my girl friends for supper. The four of us worked together over forty years ago, which seems ridiculous, and we try to meet up whenever I visit the UK. The five days of my stay were fast diminishing when I received an email from Ryanair telling me that my flight had been cancelled, giving me three more family days in the glorious sunshine. And I can’t imagine many places better to be than with your family in the beautiful green acres of the West Country during the sunniest week of the year. This entry was posted in A view of life, Expats in andalucia and tagged Bristol Airport, donkey rides, ryanair, Weston super Mare. Bookmark the permalink. 8 Responses to Unavoidably detained……. 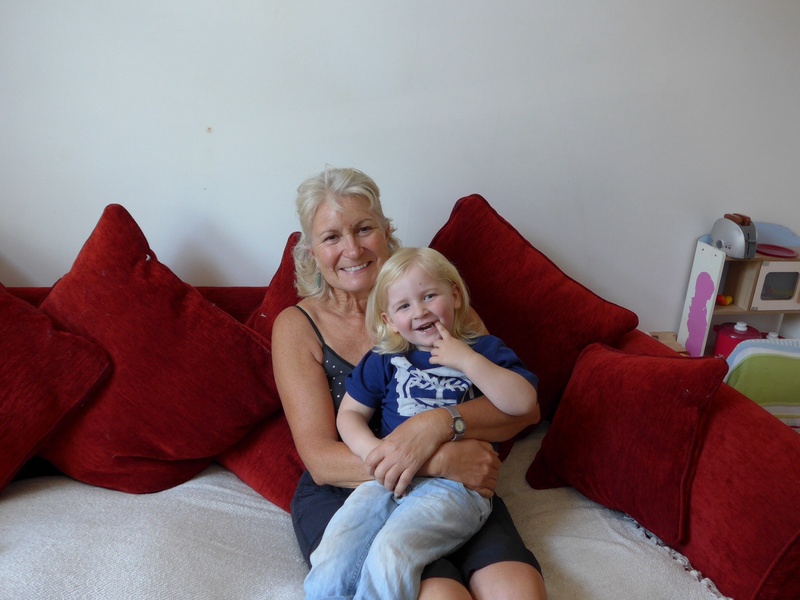 How lovely to read of your stay with your daughter….your little grandson looks adorable. What a lovely comment Grania, thanks so much. Oh, and congratulations on the “three seats” what luxury !! As luck would have it, this flight was late arriving and I had to wait about thirty minutes for my luggage! But they still get my vote – and my custom. I usually use Ryanair, too. As long as you play by their rules, they are usually much cheaper than the others. I got my come-uppance with this flight. Late arrival and had to wait for my luggage. The words ‘speak’ and ‘too soon’ come to mind! My daughter has recently moved to Worle so I am getting to know Somerset a bit better, and after visiting my sister in law in Wedmore we made a trip to Cheddar – what a gold mine that town is – it was packed with visitors. I suppose us Brits do like to make the most of any sunny weather!